Hello all! 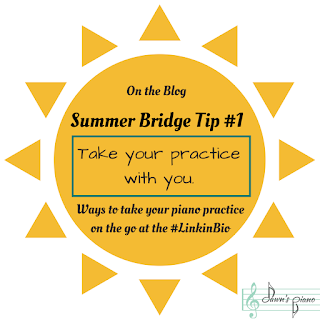 I hope you're enjoying this month's resources for staying engaged with your music education over the summer months. Today I'm sharing another Youtube playlist that discusses things you may not always encounter in every piano lesson. The videos discuss a broad range of music history, terminology & concepts, and definitely have something to offer to older students. You can learn what classifies one piece of music as an Aria? or a Fugue? A Gregorian Chant? Or you can delve into some music history & learn about the classical periods, or watch some composer bios from Bach & Mozart to John Williams. 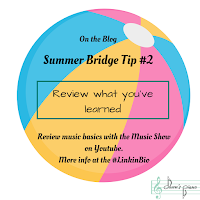 It is a widely varied playlist that I'd recommend for intermediate students who are ready for something beyond keyboard basics, and can start to see how what they are learning in lessons will plug them into the larger musical community. 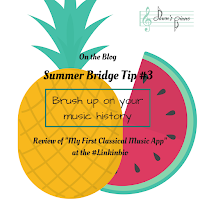 This app has been in use in my studio for the past several years, and it is such a well-formatted, intuitive introduction to music appreciation & classical music history, that I think it would make a perfect summer bridge activity to keep your elementary piano student engaging with music in new ways over the summer months. So, the app works like an animated book with a chapter on selected classical composers, another on the parts of the orchestra & instrument families, and a third on what music is & where you can find it out in the real world. Every page is interactive with illustrations, and text that you can tap to be read aloud, and recordings of the discussed music. This makes for a great format for young students to read on their own. And they can choose navigate through it in order, or pick & choose where to go next from the home page. Reviewing what we've learned is so important for young musicians. And summertime provides the perfect opportunity to pull out your favorite pieces & reinforce what you learned the past year. This week I'm sharing a short Youtube series that covers some music theory basics for young music students. The episodes are short, the characters are goofy, and the videos do some great reinforcing of musical concepts like beat, rhythm, rests, high pitch vs low pitch, line & space notes etc. There are only 6 episodes so this is a great show to watch a quick episode each day while on a vacation, and if you've got the time, maybe have a quick discussion about what the video is covering with your piano kid. That way, they can pick up right where they left off in the fall. Summer means vacations, camps & all kinds of fun activities that get you out and about seeing the world around you! This also means you will be away from your piano while on those trips. So how can students keep up their piano chops? 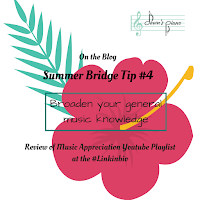 Well, the series of blog posts for June will be all about keeping your kid connected to their music in varied ways during their summer activities. This week, I'm linking to some of the articles I've shared on this blog for taking your music with you when you travel. For Long Haul trips, check out some of these tips for practicing wherever you may be, and the best part about these is, you don't need your instrument.